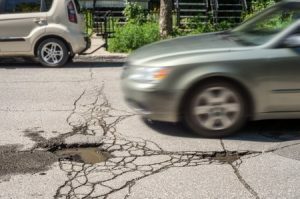 Accidents and injuries caused to drivers, cyclists and pedestrians by potholes are more common than you think and cost the country many millions in compensation every year. The Highways Agency, local authority and council have a responsibility towards ensuring roads and pavements are maintained to a high standard, and where they are found to have acted negligibly towards the situation you can make a public liability claim for a pothole injury. If you feel you are entitled to make a claim for a pothole injury, read our guide below which covers all of the most frequently asked questions. What Exactly Is A Pothole? Chipping and cracking can affect a road when extreme weather conditions affect your area. When water seeps into these holes, particularly during winter, they freeze and thaw off. The holes eventually develop into what we call potholes. Extremely large potholes are normally repaired as soon as they can be by the local council or the organisation responsible. A smaller pothole is okay to be left until a suitable repair has been scheduled. When a car or bike wheel runs over a small pothole it doesn’t have much effect. However, larger potholes can prove a serious danger to all road users. They can cause cars to noticeably drop down and change direction, a hazard to pedestrians, and cyclists may even be thrown from their bikes in extreme cases when they hit a deep pothole unaware. How To Know Who Is Responsible? It depends on the road you are injured on as to who is responsible for the pothole that caused your accident. For instance, if you experienced an accident on what is known as a ‘trunk road’, it is generally the responsibility of The Highways Agency. This agency is a part of the Department of Transport and a trunk road normally refers to the main road. The local council receives funding from the government to maintain its roads. You can report potholes to your local council via their website or by phoning their repairs contact number. If you have reported a pothole that subsequently caused you to have an accident, it will most likely be a positive for your case. If you fell, slipped tripped or were involved in an accident on a private road as a result of a pothole; the responsibility falls on the property or road owner. To make any claim for personal liability from a pothole injury, you should seek the help and advice of a legal expert. How Do You Make A Public Liability Claim For A Pothole Injury? It is relatively easy to make a compensation claim for a pothole injury. Once you have a professional and experienced personal injury lawyer on board, they will help you every step of the way. You could be able to claim not just for the physical injuries you sustained, but also for the psychological injuries you sustained from the accident. As with all personal injury claims, there is a strict time window you have to make your claim within. Therefore, it is vital you contact a lawyer as soon as you can and put forward your claim, as you only have three years from the date when the accident happened, or you won’t be eligible for compensation. What Does Your Personal Liability Lawyer Need? Photographs of the pothole taken at the time of the accident, or soon afterwards. The contact details, including names, addresses and phone numbers of any eyewitnesses to your accident, and/or the length of time the pothole had been on the road or pavement without it being fixed. If you can find out if the pothole had been reported previously, that’s a bonus and could prove negligence. Detailed list of your injuries, including medical reports from your GP and other medical professionals who may have worked with you or are still working with you. The date and time of the accident as well as the location. Further to this evidence, it may be necessary for your personal injury lawyer to request CCTV if there is any, of the accident to help prove it wasn’t your fault. If you are in an urban environment, check around to see if there are any cameras which may have picked up the accident and request a copy of the footage. General damages, such as a lump sum of money on behalf of the suffering and pain you experienced. More specialist damages cover for any financial problems you had as a result of the accident including travel expenses to and from the hospital or other medical institutions, loss of earnings from time off work or stopping work altogether, medical prescriptions, treatments and other appointments. Personal injury claims can be a very complicated process if you don’t have legal support from an experienced and qualified lawyer. Therefore, it is in your best interest to seek one out, who will take you through the procedure step by step. The great thing is that they normally take on cases for compensation on a ‘no win, no fee’ basis. This means that you are not expected to pay for their assistance with your personal injury claim if your claim, for whatever reason, is not successful. So rather than worrying about whether or not you will have to pay legal fees, take action today and see if you can win compensation that you deserve for the pain, suffering and lifestyle changes you have had to make due to a pothole injury. This entry was posted in Public Liability on December 4, 2017 by admin. Millions of people each and every day come and go through the doors of shopping centres, shops, petrol stations and supermarkets. For most, it’s an experience free from pain and accidents. However, accidents can happen and the injuries you suffer from in these kinds of incidents can range from minor to severe. There are many kinds of accidents which can happen in a shop because it is a place where a business and its customers interact directly. There are various health and safety measures to be taken into account by the owner, including appropriate signage and the provision of an environment which is hygienically clean and safe for all ages. If you have been involved in an accident in a shopping area of any sort, you may be eligible for compensation. In this guide, we will look at the subject in more detail, and you will find out everything from whether your claim is even viable to how much you’re able to claim compensation for. Spillages of food and/or liquids, which if they are not dealt with and cleaned up can cause accidents. If you have suffered from an accident in a shop setting of any kind and have injuries that were not your fault, you may be eligible for compensation. We don’t advice making a claim on your own against a business or corporation as it’s likely their resources will be far greater than yours. Instead you should speak to a fully qualified and professional personal liability lawyer with experience in dealing with shop accidents to discuss the possibility of your claim being successful. Shop owners have managers have a duty of care to customers and other visitors to the store as outlined by the Occupier’s Liability Act 1957. However, it doesn’t always transpire that this duty of care is followed through on and as a result – accidents and injuries happen with the owner are in breach of the safety rules. For instance, failing to ensure that the shop has a good inspection record, is kept clean and maintained to a reasonable degree. Failing to use the appropriate warning notices and signs, when there is a potential risk. When these things are not in place, and you suffer an injury, you may be eligible to claim compensation. Even if you feel you may be partially responsible, you could still be able to make a compensation claim. To help you out, you need to contact a personal accident lawyer that will be able to tell you if you have a case for a successful compensation claim. How Much Compensation Can You Claim Against A Shop? Loss of earnings because of time off or leaving your job. Broken bones take weeks to heal and emotional trauma may persist for months. Assistance and care, if you require help on a daily basis from members of your family with your children, pets, around the house or even when you need to go shopping. Replacing or repairing personal possessions that were damaged in the accident such as a mobile phone or item of clothing. How Can You Make A Personal Injury Compensation Claim? In order to successfully make a claim, you need to get in contact with a personal injury lawyer who will discuss the details of your accident and injuries to see if you are eligible. They need evidence to prove there was negligence and that the shop owner failed to uphold their duty of care to you as a visitor or customer. As all shops, supermarkets and similar public shopping areas have CCTV, your personal injury lawyer will request footage for the time of the accident, if the owner suggests that the hazard hadn’t existed long enough for it to be handled appropriately before accidents occurred. It can be a complicated and often long and drawn-out process, so it is recommended that you avoid representing yourself and putting forward your own claim. You need the help of a professional personal injury lawyer – particularly if they have experience with similar claims for compensation against shops and other public areas and premises. They will help you through the process from start to finish and do their very best to secure a fair level of compensation. This entry was posted in Public Liability on November 21, 2017 by admin.